I love this time of the season. We’ve had a month or more of early season racing (four so far for me) and you can feel your form starting to build. The weekend rides have started to get shorter and more intense, testing each other’s legs at every 30 sign as we come into towns & villages. The long steady rides of Mallorca seem a distant memory, a time to get some miles in riding with team-mates, thoughts drifting to what the season ahead may hold. After breaking my collarbone in November I thought that it would be a slower start to the season for me, and that seemed to be borne out by my first race in the Presentation TT at the end of March, when I didn’t feel comfortable on the bike at all. However, a month on and things are falling into place. A couple of weeks ago I did a 10 on the Saturday and a 25 on the Sunday and posted reasonable early-season times for both (24.20 and 1.03.44, which included 1.30 lost with a mechanical problem!). I also felt much happier on the bike. I’ve been working in the gym with Ewan Murray over the past month, the focus on building strength back into my shoulder as well as working on my core strength. I can really feel the difference this is making. 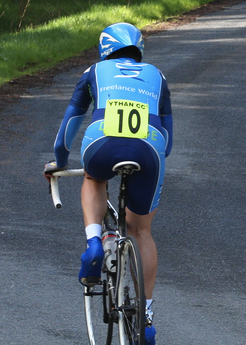 This weekend is my final block of weekend training as I build towards my first big goal of the season – the National 10TT on 29th May (also my son Andy’s birthday!). After today I’ve got a 25 next Sunday, the Etape Caledonia on the 15th and another 25 the week after. I’ve also got some evening TT’s as our club evening league starts this Tuesday. This will all help to put some zip into my legs. What am I aiming for at the National 10? Well, I’m not going to win it or even threaten the podium, however my goal is to try to beat 23 minutes. My PB’s currently 23:41, so it’s a big ask, but with my new bike position I’m putting out a lot more power and my legs are feeling great as the form builds. I believe I can do it. Previous Post Working 9-5 what a way to make a living!